Despite stern warning from the Chairman of the Western Area Rural District Council (WARDC) for people to stop burying their loved ones at the monumental Ebola Cemetery, volunteer grave diggers are still demanding Le80, 000 from people to bury their dead at the said cemetery. The Ebola cemetery, which was established by Concern Worldwide through the government of Sierra Leone, was used to bury 10,040 dead bodies from October 2014 to February 2016, when the disease struck Sierra Leone. Concern Worldwide managed the cemetery and employed grave diggers and caretakers that included family members that served as liaison officers to assist people identify the tombs of their relatives. But after the outbreak was contained, it was handed over to WARDC in order to ensure its sustainability. The same cemetery was also used to bury victims of the August 14, 2017, mudslide and flood incidents in Freetown. 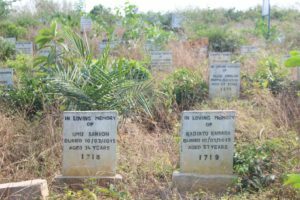 During Concord Times’ visit to the cemetery last Thursday, 17th January, 2019, one of the 10 volunteers, Sahr Bongar, who spoke on behalf of his colleagues, said payment for burial varies, but most times, some community people paid eighty thousand Leones (Le80,000). He said they were at the site to refill the mud that was removed from the graves by erosion, and also to dig graves for community burial on voluntary basis. He added that after digging the graves, they would ask for Le80,000 as a compensation. He revealed that since the Ebola was contained, the site had been handed over to WARDC but the latter had not been providing them with incentives for their service. Bongar said before they could allow any community burial at the cemetery, relatives are asked to submit a valid letter of permission from the village head and hospital authority in that community. He said the essence of the burial permit was to ascertain the community where the person died and the cause of death. However, Chairman, Western Area Rural District Council, Kasho J. Holland-Cole, charged that no community burial is allowed at the Ebola cemetery. “Council has never asked anyone to extort money from people for burial at the Ebola cemetery because we have stopped them long ago. The burial permits they are receiving are not coming from council and we are not aware of such ugly development,” he said. He said council wanted to reserve the Ebola cemetery as a monument for current and future researchers, and even for touristic sightseeing. He revealed that plans were underway to paint all the tombs and even re-write the inscriptions properly. “There are many countries in the world that are deriving revenue from such monuments. If the council improves it, it would be a fantastic touristic site. But if we continue to allow community burial at the site, it will be misused and its value will decline,” he said. There are rumours that most of those communities around the Ebola cemetery have their own cemeteries but have sold them for construction of dwelling houses. When quizzed if he’s aware of such ugly development, he replied in the negative, but promised to investigate and come up with a finding. In order to protect the cemetery, he said council has recruited additional metropolitan police so as to deploy them at the site. “We have also been looking forward to receiving assistance from development partners to erect pillars at the cemetery, demarcating the land belonging to the cemetery, thereby preventing encroachers, who have already been encroaching on the said land,” he said. He noted that most of the signposts at the cemetery have faded but plans were underway for them to be installed with the correct inscriptions.